Rachel Sherman | Pen Parentis Literary Salons | Parenting Done. Write. 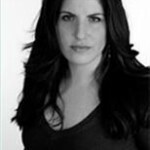 Rachel Sherman holds an MFA in fiction from Columbia University. Her short stories have appeared in various publications including the anthology Full Frontal Fiction: The Best of Nerve Anthology. Her book of short stories, The First Hurt was short listed for The Frank O’Connor International Short Story Award, and was named one of the 25 Books to Remember from 2006 by the New York Public Library.